How to make at home! There are few things in this world as popular right now as bacon. Be it side, streaky, middle, back, cottage, jowl or slab, bacon has become not just a staple of kitchens (almost) all over the world, but also countless memes all across social media and has even been dubbed ‘the duct tape of food.’ However, store bought bacon is not your only option: here’s how to make bacon at home! Before we get started, I need to clear something up. 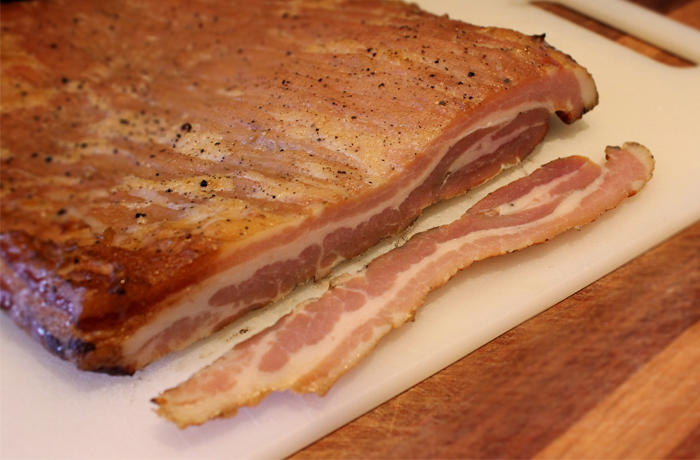 Store bought bacon is cured with either sodium nitrite or sometimes potassium nitrate. This is to prevent botulism – a rare but potentially fatal illness, killing 5-10% of people who contract it. The QLD government reports that there is only one case of botulism per year in Australia. There is however, an argument to be made for not using these -ites and -ates. Firstly, there are cancer concerns, popular in the media over the last 12 months. Secondly there is a large and growing number of people who are extremely sensitive to the -ites and -ates which can trigger serious medical conditions such as migraines. When making your own bacon at home you need to do your own research and decide whether you want to add some -ites or -ates to your mix or not. In this case, I have not used them: I like to make what I call a ‘natural cure’. The most important thing to do is to decide what you want to use as a cure. The two essential ingredients are salt and sugar. After this, the only limit is your imagination. You can use a dry rub or you can make a wet rub. My buddy Pogojim, who first introduced me to home made bacon, likes to make up his own secret cure including juniper berries. If you buy your pork belly from a butcher then you can ask them to do any trimming for you. I bought mine on a whim from a supermarket (Ssssh – don’t tell anyone!) and so had to trim mine up myself. In this case I chose to remove the skin, or rind. Some people prefer their bacon with the rind on. I chose to remove it as I find it very difficult to slice through after I’ve finished smoking it. To remove it, just take a small, sharp knife and start in one corner making incisions just under the skin, and peel it back, making more incisions when necessary. Lay the skin flat in a large ziplock bag and put it in the freezer to use later to make cracklins or pork rinds. Apply your dry rub nice and thick and seal it in a ziplock bag. Keep applying the rub until no more will stick to the meat. If you’re using a wet rub, put the pork belly in the bag first and then add the wet rub. It’s not a bad idea to double bag the bellies as liquids will form in the bag as the cure draws moisture out of the meat. Put the bags in a tray and put them in the fridge for 5-7 days. Turn the bags over each day. Eventually your rub will draw out enough moisture that it starts to resemble a brine. After five to seven days, turning once a day, your belly will be ready to be smoked. You’ll notice that a brine has formed inside the bag, the colours have darkened and the meat will be firmer to the touch. There are a few things that you need to do first though, before you head for the smoker. Remove the bellies from their bags and rinse them thoroughly under cold running water. This will wash off any excess cure and avoid over-salting the bacon. Pad the bellies dry with paper towel, place them on a cake rack over a tray and put them back in the fridge for 6-24 hours. This will allow a pellicle to form on the surface of the bellies which helps the smoke stick to the meat. Set your BBQ or smoker up for indirect cooking and once it’s at a steady 225F (107C), put on your bellies. Put on some wood chunks for smoke (apple is always best with pork) and smoke the bellies until they reach an internal temperature of 165F (74C). The last thing that you need to do is slice your bacon. I like to mix mine up a bit: I’ll slice some for traditional uses and I’ll leave some in block form to use as lardons for other forms of cooking. 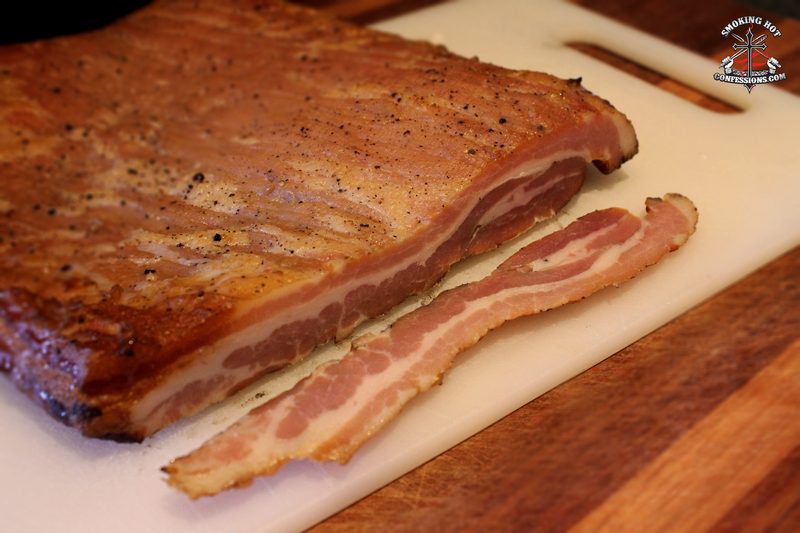 If you’re wanting slices there is a trick you must know – bacon will slice more easily when it’s chilled. To this end, let your bacon cool after it’s finished in the smoker and then put it in the fridge for a few hours. As the bacon chills it will firm up, making it much easier to cut thin slices. In the same way that ribs or brisket always taste better when made at home, store-bought bacon will never compare to the bacon you can make yourself. It’s surprisingly easy and really quite foolproof. Do some experiments with your favourite flavours and let me know what you come up with in the comments below. Home made bacon = yum!